This page is a translated version of the page Soennecken and the translation is 100% complete. The Soennecken was founded in 1875, and born as a manufacturer of pens and inkwells. 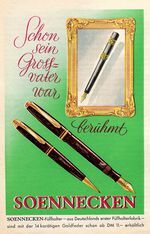 It is one of the most important historical producers of fountain pens in Germany and is widely regarded as the first German company to have made fountain pens that were already included in his catalog of 1890. The golden age of the company is to be situated in the '30s when Soennecken produced probably the best pens available on the German market. Like other companies it suffered a decisive crisis on the '60s due to the introduction of the disposable ballpoint pens and closed its doors in 1967. Today the brand name is used for stationery items. Because of their high quality, remained constant even in the final crisis period of the company, the Soennecken fountain pens are now high sought with lot of interest from collectors. Soennecken Verlag was founded in 1875 when Friedrich Soennecken went into business by opening a stationery store in Iserlohn. Friederich Soennecken had already founded in 1868 the Kaufmannische Verein Iserlohn, an association dedicated to business correspondence, and had developed his own style of calligraphy. With the opening of the store, he started sales of nibs, ink and handwriting workbooks that were a hit among the college students, so that in 1876 he moved to the university city of Bonn. Due to the success of his style the company had expanded significantly, and in 1883 a three floors home was built in Poppelsdorf, in the Bonn center, where approximately forty employees operates. In this same period, the company expanded in the writing instruments market, thanks to inventions like the loose-leaf notebook, and the paper drill. 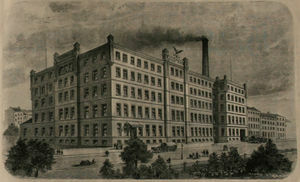 The Soennecken became one of the leading German manufacturers in the field of stationery, also extending its production to office furniture. The start of fountain pens production is not precisely known, but it is known that they were listed in a catalog of 1890, along with over 150 other stationery products. These models were hard rubber eyedropper pens, characterized by a lock line for the cap. These pens were characterized by the imprinting F. Soennecken 554 and were available in four sizes (numbered from 3 to 6) and equipped with the gold nib produced by the company. There is not much information available about these early models; according to Lambrou there were different variants: the number 575 with cylindrical cap, the number 576 with conical cap and an overfeed feeder, the number 577 with conical cap. The first safety fountain pen was built in 1905 (more precisely it appears for the first time in a catalog of that year). It was making use of a device similar to that adopted by Kaweco, with a bump on the bottom of the cap that allowed to facilitate the rotation (and the consequent return of the mechanism), by setting the cap on the back of the pen, in a corresponding incision. There were shown over 30 different models of those new pens in a 1905 catalog. In 1913 the range of fountain pens was extended. Smooth body models were identified with numbers 8, 10, 12, 14 and 16, the carved ones with numbers 810, 812, 814, 816 up to 820, and with prices between 10 and 25 marks. Models were also made with gold plated or gold bands, identified by the application of a Z after the number of the pen. Models were also made ​​of precious metals, the gold ones were identified by adding number 11 before the normal model number, while the number 10 was used for the silver ones. In 1927 were introduced the first lever filler models, discontinued after three years, in 1930, when it was introduced a particular button filler system, characterized by a protection shell that allowed to hide the hard rubber button, which was operated by rotating the shell. The new system received great acclaim, although the production of safety pens was maintained until 1939. The finest line of pens, equipped with the new button filler system, was named Rheingold (Rhein gold), inspired by the name of the treasure it the Wagner's ring Cycle, and were characterized by a decoration on top of the cap that consisted in an "S" letter surrounded by an inlaid white circle in turn surrounded by inlaid rays. In the following models the logo was simplified by removing the circle, and keeping the "S" surrounded by rays like a sun, in addition the filler button was made in white color to make it more visible. In 1931, driven by competition suffered in previous years, particularly because of the Osmia and its production of celluloid Duofold on behalf of the Parker, also Soennecken began to use this to this material. So the Rheingold series became available, as well as in the classic black, in blue, green, red and brown, with a luxury model in Pearl and Black. The new celluloid models were available in three sizes, 912, 913 and 916, there was also an economic model with the number 305 andd no logo on the cap, available in black, blue, red, green and marbled pearl-edged blacks , and another economic model marked with the number 406. In 1933 the Rheingold series was restyled and produced in four different sizes; models were given the numbers 1911, 1913, 1915 and 1917. These were joined by a few second-tier models: the 306 produced in black, blue and pearl, and the 205, an economic pen, also called Seneca. Was also produced a stilographic pen for technical drawing, numbered as 560A. In 1935 was introduced the luxury model Präsident, with the body equipped with a transparent section and a new filling system, then used also on Rheingold. During those years the increasing success of the piston filler introduced by Pelikan pushed even Soennecken to adopt this system with the 1306 model. It was built ​​according in an extremely robust way as the fixing pin and the piston were made ​​of brass. Despite this new system Soennecken pens were marketed at a price lower than equivalent models of the Montblanc and Pelikan. At the same time was marketed an economic model for students, the S4, also called Sütterlin. The one preceding the WWII was the company most successful period, with a production ranged from fountain pens to office furniture, covering all areas for stationery items. In 1938 the models were the 507 510 and 510S, with a new logo consists of an eagle perched on a pen inside of a circle, also used on Präsident in a catalogue from 1937/38 also appear dome versions on the new Rheingold line with the numbers 613 and 616. When during the war the use of gold nibs became impossible, Soennecken resorted to palladium, marked with the symbol Pargo in the nibs. In 1940 the production was reduced to only four models, 506, 507, 510 and S4. The war was very heavy on the company, factories in Bonn were completely destroyed by bombing, but in 1945 production was resumed by the son and the grandson of the founder. 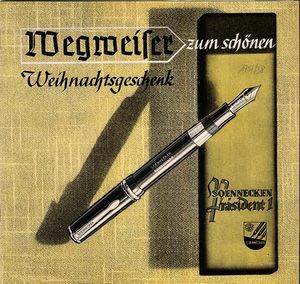 Ttwo models of the Präsident line were produced, with two-tone gold nib and black body and the production of the two Rheingold models with the numbers 613 and 616 was resumed, these pens were made of celluloid in black, blue, gray, and pearly green, although other less common colors are known. Finally, was restarted the production of piston filler models, with the numbers 504, 506, 507 and 510. These, in addition to the classic black color, were also produced in pearl celluloid with a woven patterned in blue, red, gray or green. In 1947 was introduced a new line of piston filler pens with steel nib, more squat in shape, wider, with a thicker body and a flattened cap. These were called, depending on the size, with the numbers 110, 112, 116 and 120. These were initially produced in black, but later were also introduced celluloid versions with woven motifs in blue or gray. In 1949 was introduced a new line with the three models 410, 414 and 420, with a new piston filler system patented in 1939, where the knob of the plunger was locked when at rest. In order to load the pen it was needed to lift the cap slightly to unlock it to allow the rotation, once the pen is filled and the plunger brought back the knob is automatically locked into position, avoiding improper rotations. The new models of fountain pens were thinner and more streamlined. In these same years were produced new models for the student market, marked S4 and S6, and a series of streamlined black celluloid pens, called 100 , 100 Extras, 101 Lady and Schreibneister. In the years from 1947 to 1950 four new lines of pens were introduced, each one characterized by three different sizes named Lady, Superior and Extra, in increasing dimensions. The most economical line was the 444, produced in mainly in black color and in smaller sizes, followed by the line 333 produced in different colors. The good quality 222 line was produced in a particular lizard skin celluloid in red, green, gray and black with a translucent section and with a single piece clip fixed srewed on the top of the cap. The line that was at top of the range was the 111, with larger dimensions and produced in eight different colors with herringbone motifs celluloid. Although the pens of the two highest series were of exceptional quality, they never enjoyed, partly because a too high price, a great success (which makes them rare and much sought after by collectors). This, together with the difficulties encountered even in sales of office furniture and stationery, led to a decline in the company during the 50's. In the '60s a revival was attempted: unnecessary lines were removed and only economic models 100 and 101 left in production. Was then sought a partnership with the French company Bayard, which led to creation of a new series of six pens sold in France, with a filling system similar to those of Swan Visofil. But these pens were not successful, being done in the boom period of the disposable ballpoint pen, and in 1967 Soennecken closed its doors. ↑ the informations on the company initial production are taken mostly from those reported by A. Lambrou in his books: please note that many inaccuracies were found in other historical data he reported, so their reliability is relative.